Freelance writer, Independent Consultant on the Rights and Protection of Women and Children in Conflict, Peacebuilding and Development. The unprecedented scale of war and human catastrophe that has raged across the world has marked this year as one of the most violent in recent times. Greater pessimism is expressed around prospects for peace, an idea that seems distant at best and unattainable at worst. Notwithstanding this, with today honoring International Peace Day, it is an opportune time to recognise all efforts towards mitigating conflict across the globe. Social media is an essential leverage to inspire all sectors of society in every nation to unite for peace. The exciting work of International Alert's groundbreaking Talking Peace Festival (#talkingpeace) is utilizing this platform in its efforts to create a more tolerant and peaceful world. Marking the 30th anniversary of the General Assembly Declaration on the Rights of Peoples to Peace, this year's theme for International Peace Day is the "Rights of the Peoples Peace." The Declaration on the Rights of Peoples to Peace firmly recognizes that peace is essential for the fulfilment and enjoyment of all human rights. The United Nations is inviting all nations and people to honor a cessation of hostilities across the world and raise awareness of issues related to peace. International Alert's Talking Peace Festival is commemorating the Day in a unique and inspiring peace initiative by running a non-stop hackathon for 36 hours using the hashtag #peacehack. Twitter is being mobilised as a platform for generating ideas and tools for peace building. During this time, peace builders, coders and designers are being brought together to create and provide solutions that pave the way for peace and stability. 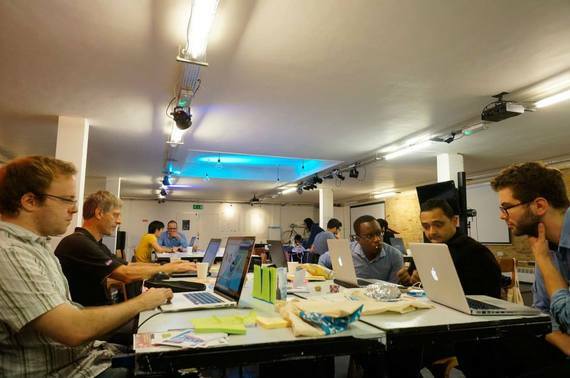 #Peacehack brings two very different fields together. Peace builders are skilled in identifying the obstacles and challenges to peace, whilst developers use their creative mindset to translate and resolve these issues using technology. By connecting these two sectors together, #peacehack is generating an innovative but holistic approach towards laying the foundation for durable peace. The significance of #peacehack cannot be underestimated in age when there are over one billion total users on Twitter, sending 500 million Tweets per day. Social media is a powerful tool of engagement and an enabler of change, which is helping to challenge and shift negative narratives and stereotypes to one that inspires dialogue and understanding of the "other." With Twitter providing such vast outreach, messages for peace are resonating with a greater number of people across all nations on an unprecedented scale. People of all religious, cultural, and ethnic diversity are working hard to end conflict within their community. Social media is increasingly being used as a medium to spotlight the challenges in building peace and help bridge the divide between adversaries. With today's youth being one of the most engaged and active users of social media, it is important to encourage their participation towards preventing and ending cycles of conflict. Where social media captures the imagination of citizens, it can be a genuine means to empower communities and take ownership of conflict prevention. It is certainly true that social media alone cannot resolve some of today's most entrenched conflicts; the hard work of classical diplomacy is still very much essential here. However, social media, by virtue of reaching out to all people, is a great facilitator of conflict resolution and diplomacy. Within communities, conflict transformation can only occur when people of all walks of life start to act on their sentiments for peace. With more people tweeting, noticing and acting upon each other's call to peace, the power of harnessing social media as a positive "social change multiplier" is realised. Throughout this month, International Alert has been tweeting about the many activities taking place during the Talking Peace Festival, with the aim to generate dialogue and overcome social divides barring peace. To mark International Peace Day, the inspiring and talented work of today's peace workers are being showcased, highlighting the exciting and diverse avenues to pursue peace, including The Amahoro Generation photo exhibition, #art4peace campaign, Conflict Kitchen London, Are You Taking The Peace? International Day of Peace is a timely reminder of the positive value social media plays towards conflict transformation through the combined effort of dialogue and peace activism. Talking Peace Festival highlights the importance of people's stake in society and empowers their community to work together for a more secure and prosperous future. Tweeting for peace and encouraging greater peace activism can silence the hail of bullets, indeed tomorrow's headlines can be fought and won on social media. After today, it is vital that we continue #talkingpeace to ensure that all people have the chance to live and enjoy a future in peace and security.